Many people receive medical care at the Munuki Seventh-day Adventist Clinic located on the mission compound in Juba. While there are basic Adventist church buildings in South Sudan, the children must meet under the trees for Sabbath School, Adventurers, Pathfinders, and other youth activities. Your Thirteenth Sabbath Offering will provide a “Lamb Shelter” for these children. David, 16, was an altar boy at the Catholic Church when his friend, Otto, started telling him about the true Sabbath. “Why don’t you come visit my church,” Otto asked, “and see what it’s all about?” Without telling his family David went with Otto to the Seventh-day Adventist church one Sabbath. He liked it so much that he planned to attend the next Sabbath. However, that’s when the conflict with his father began. David’s father wanted him to work in the garden, but David told him that he couldn’t because he was going to church instead. His father threatened to disown him but David went to church anyway. David stopped attending the Adventist church for a while, but then one day Otto came by and told David that he had missed him at church and wondered why he hadn’t come. David said that he was afraid to go because the way his father had spoken to him was “dangerous.” However, the next Sabbath David was back at the Adventist church. That’s when his father ordered him to leave home. David had no place to go so he went to the most logical place he could think of—the Seventh-day Adventist church. He slept in the church for three nights, went to school in the mornings and studied with friends in the afternoons. When the local elder learned of David’s situation, he counseled with the district pastor and the two men arranged a meeting with David’s father. They wanted to tell him that the direction David was going was the best way for the youth and that he would end up being a better son. Sadly, Mr. Akena didn’t show up for the appointment. To add more stress to David’s life, it was the time of year for his school exams. In spite of his family difficulties, however, he did very well on his exams. Church members cared for David in their homes and eventually the father’s anger subsided a bit, but he still wouldn’t have much to do with the boy. At first the mother took sides with her husband but then she weakened “because of her motherly love,” says David. His parents thought David was confused by the Adventist church and no one in his family supported him in his new beliefs. Mrs. Akena decided to enroll David in a private boarding school a short distance from home. 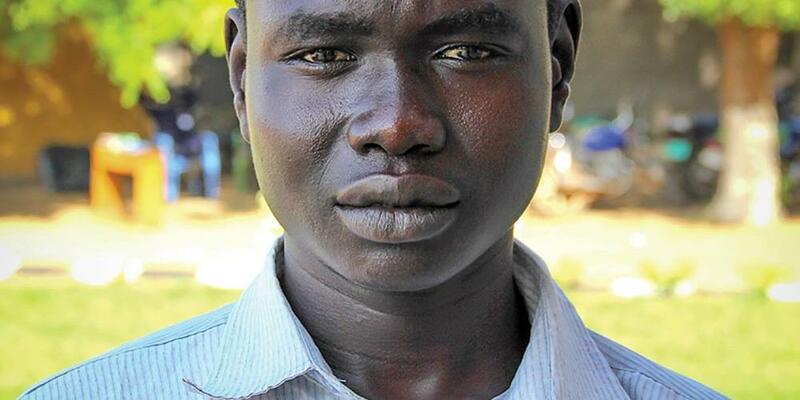 Mr. Akena wouldn’t pay the tuition but David’s mother found a way to secretly pay. Throughout these difficult times Otto shared several Bible texts with David and the promises were a huge encouragement to him. He felt peace when he read Matthew 10:28-31 and realized that God cared for little sparrows and cared for him even more. The idea that God even knew how many hairs were on his head was amazing and comforting to him. Reading in Matthew 10 (verses 34-39) about how one’s accepting Christ often brings division to a home seemed to be describing his situation completely. David came home for the holidays during his second term at the boarding school. He talked to his sisters about his religion and the girls were willing to listen. To David’s delight, both sisters were eventually baptized. Then the sad story of rejection started again. Mr. Akena ordered his daughters out of the house. They, too, went to live with church members.